One of the joys of creating custom outdoor living spaces is seeing how it can truly transform a property and how the homeowners utilize their space. With every project, we consult with our clients and discuss their needs, tastes and budgets. Each consultation and resulting deck, porch, patio or combination project is different. Empty-nesters that are looking for a quiet space to have their morning coffee will have different needs than the family of 5 that like to spend every weekend entertaining friends and family. When the space doesn’t fit the family is when we see those structures go unused. 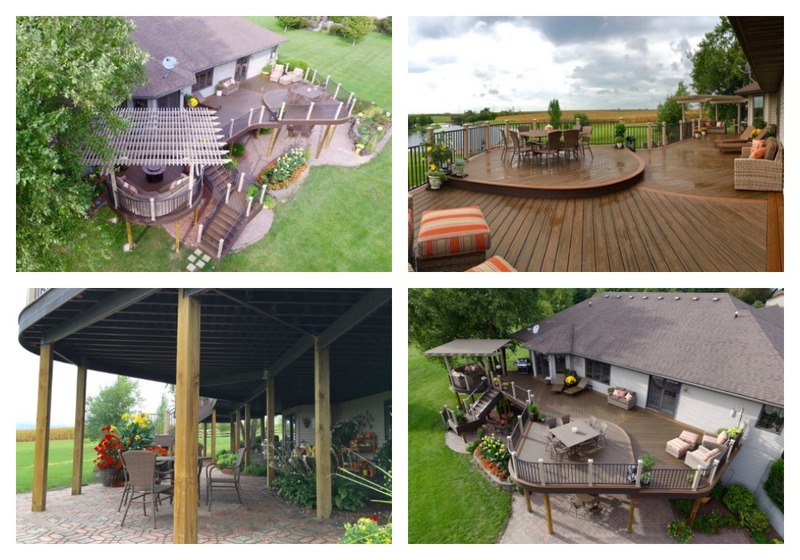 Here’s a great example from Archadeck of Central Iowa that took space and needs into account for the ultimate backyard retreat. This home in Iowa had a large rectangular deck and lower level brick paver patio. While spacious, the homeowners wanted something with more style and flow with separate and defined areas for lounging, dining and entertaining. Archadeck was brought in to design and build a more interesting space. Harold Cross, owner of Archadeck of Central Iowa, created a space with three main conversation areas, utilizing a slight elevation change and pergola to add definition (and shade) to the deck. Although more cumbersome to build, a curved design was used to add more flow and interest to the deck. Archadeck suggested low-maintenance materials with slight color variations for the perfect finished project. Not one to forget about the existing patio below, Archadeck installed an underdecking solution to keep that space dry when it rains and provide an additional living area. On especially hot days, the homeowners can use the lower patio as a reprieve from the sun. At Archadeck, we pride ourselves on using the canvas a home provides and creating an outdoor addition that adds to it. Our goal is design and build custom spaces that not only look fabulous but are used by owners, enhancing their outdoor living experience. If you’re looking to update your outdoor living spaces, please contact your nearest Archadeck location or fill out the form below. At Archadeck Outdoor Living, our motto is “better building by design.” Each one of our projects is custom designed and built with the homeowners needs and tastes in mind. How the space functions as room is integral in any living space design, be it indoors or outdoors, and how one person uses a space can be vastly different than the next. It’s our job to take the clients’ needs and create a space that not only looks beautiful but will truly work for them. 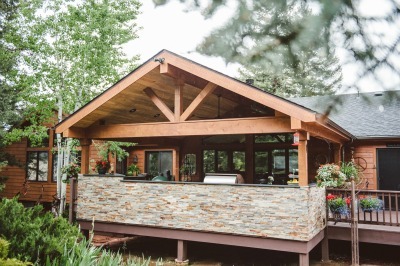 This recent project from our deck builder outside of Denver is a great example of creating space that’s perfect for the homeowners. When designing this covered porch, the clients were clear: they wanted a space where they could cook, eat and relax outdoors when the weather was nice. They didn’t want it to be cramped and it needed to blend into the overall style of the home. 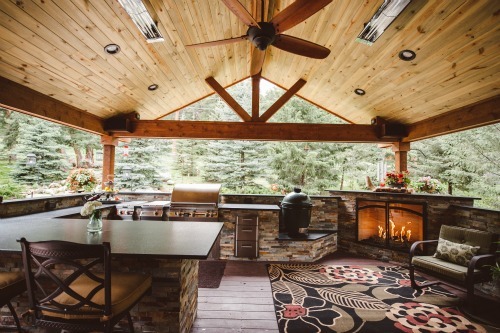 The Archadeck team knew the most important thing for this family was to create a well-equipped outdoor kitchen. It needed space for preparation, cooking and serving and needed to be the center of the structure. A U-shaped kitchen was created with everything a chef could want, including eating space for when the cooking is complete. To ensure that the space could be used most of the ear, the Colorado weather needed to be addressed. Sometimes it’s hot, sometimes it’s cold and sometimes, it’s just right. For the warm months, the covered porch will provide some reprieve from the heat by providing shade, but even then it could be warm, so a large ceiling fan was mounted in the middle of the porch to provide some air flow. For the cooler months, two additions were strategically added to the design. As you can see there is a beautiful outdoor fireplace in the corner. It’s a focal point of the entire porch, but we weren’t sure it would be enough to keep people outdoors. In addition to the fire feature, two heaters were installed in the ceiling as well, heating the area below and instantly increasing its function. The finishes on the entire space were all about blending it all together with the home. Knotty woods and natural stacked stone were used to complement and follow the house’s color palette and finishes to make it look as if the space had always been there. If you’re interested in enhancing the functionality of your outdoor living space, please contact one of our local offices. We’re happy help you to move outside with our better building by design.